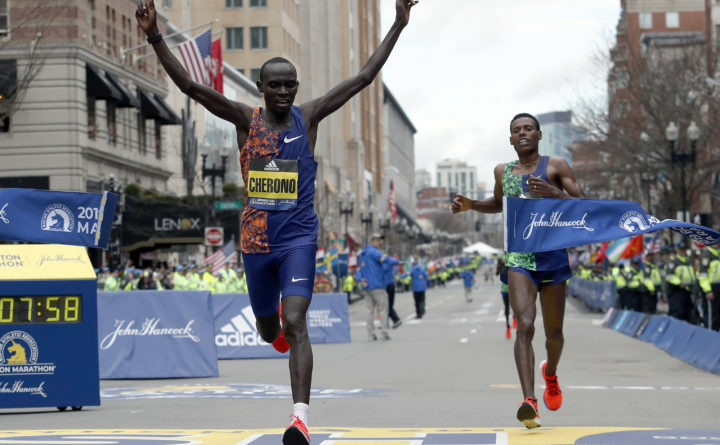 Lawrence Cherono of Kenya breaks the tape to win the 123rd Boston Marathon in front of Lelisa Desisa of Ethiopia, right, on Monday in Boston. Daniel Romanchuk, 20, became the youngest-ever men’s wheelchair champion in Boston, finishing in 1:21:36 for the fastest time ever for an American. Manuela Schar won the women’s wheelchair race for the second time, adding it to her titles in Berlin, Chicago, New York and Tokyo. Associated Press writer Jennifer McDermott contributed to this report.